The hard money lending industry is known for making high-interest loans. In this type of industry, fraudulent lending practices commonly occur. If you are considering a hard money loan, here are a few things to consider about identifying fraudulent hard money lending practices. One thing that you will definitely need to look out for is when a lender charges excessive fees. While there will be some fees associated with getting a loan, you should not have to pay excessively for these fees. In order to see if the fees that are being charged are excessive, you need to shop around with different lenders. Compare the different fees that are being charged by each. This should give you an idea as to what the market rate for certain fees are. If the lender that you are considering working with is charging significantly more than every other hard money lender in the market, you should most likely stay away from him or her. The hard money lending industry is significantly different from the traditional loan industry. Therefore, you will notice many different things about how the loans are structured. Sometimes, hard money lenders will take a page from traditional lenders and charge loan points. However, if you can avoid borrowing from a lender that charges loan points, it would be for the best. Traditionally, loan points are required by lenders in order to buy down the interest rate and accommodate for questionable credit. However, the whole idea behind a hard money loan is that you do not need good credit in order to qualify. This means that you should look questionably at any hard money lender that is willing to charge you points to give you a loan. In most cases, a legitimate hard money lender is going to allow you to pay most of the money that you owe him or her on the back end. This is why most hard money loans are set up as balloon loans with interest-only payments over the life of the loan. However, some hard money lenders will ask you to pay a large fee up front. Any time a lender asks you to pay a substantial fee on the front end of a loan, you should be very skeptical. While there might be some closing costs associated with the loan, you should not have to pay the lender any large amounts of money up front. There is nothing stopping an unscrupulous hard money lender from taking your money and running. 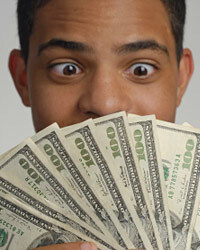 Therefore, you should be very leery of giving money to anyone that is claiming to be able to loan you money. Legitimate hard money lenders know that their clients do not have a lot of capital on hand. Most of them would never consider asking their clients to put money up on the front end of a transaction because it would significantly lower the amount of customers that they could have.